Home / Drama / Essays. / G.B. Shaw / Honours 2nd Year / Introduction to Drama / "Arms and The Man" : Dramatic Significance of Bed Room Episode. "Arms and The Man" : Dramatic Significance of Bed Room Episode. Shaw’s Arms and the Man is an anti-romantic comedy in three Acts. The first Act is one of the finest examples of his dramatic art. It constitutes the exposition of the play. It introduces to us the principal characters, communicates the main theme, and gives background information. 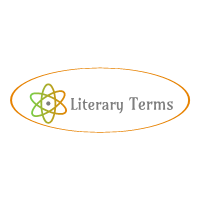 Act I opens in an atmosphere of military melodrama, which is a piece of intensely emotional and sensational action or dialogue which sometimes becomes ludicrous. Catherine and Raina create this atmosphere by their remarks and utterances about Sergius’ cavalry charge against the artillery. Catherine describes it in her own emotional way that the brave Bulgarians with their swords and eyes flashing rushed down upon their enemies like an avalanche and scattered the helpless Serbians and their allied Austrian officers like chaff before the wind. Raina becomes wild in joy hearing the news of Sergius’ victory at the battle of Slivnitza and feels that the world is a glorious place for men to perform their heroic deeds. The first Act gives background information. It refers to the Serbo-Bulgarian War of 1885 as a starting point of the action. It gives us information about the battle of Slivnitza won by Sergius by means of the cavalry charge against a battery of machine guns. It introduces to us most of the characters of the play. Raina, Catherine, Bluntschli and Louka take part in the long conversation of the first Act. Petkoff and Sergius are referred to in their conversation. The only character of the play absent in the Act is Nicola. Act I sets up the main theme of the play---the conflict between romance and realism. Raina holds romantic views about war and heroism. She thinks heroes are super human above all weaknesses. But Bluntschli represents realism. He enters her bedroom to save his life. He tries to convince her that soldiers are subject to common human frailties. They are afraid to die and most of the soldiers are born fools. He also exposes Sergius’ foolishness in his act of leading the cavalry charge against a battery of machine guns. The process of transferring Raina’s love from Sergius to Bluntschli begins in this Act. Because of Bluntschli’s realistic remarks, Raina’s illusion begins to shatter. She feels sympathy for him. She shelters him, saves his life hiding him behind the curtain, gives chocolates to satisfy his hunger and gives him her photograph, though he does not know it. At the end of the Act when Catherine tries to wake him up Raina says, “Don't mamma: the poor darling is worn out, let him sleep.” This shows the beginning of her tender feelings of love for Bluntschli. In the first Act we find a comic situation marked by irony when Louka sees a pistol lying on the ottoman in Raina’s bedroom. Seeing the pistol, Louka becomes sure of the presence of a refugee in the room. Here irony lies in the fact that though Louka sees the pistol, Raina even does not know that there is a pistol on the sofa let alone Louka has seen it. 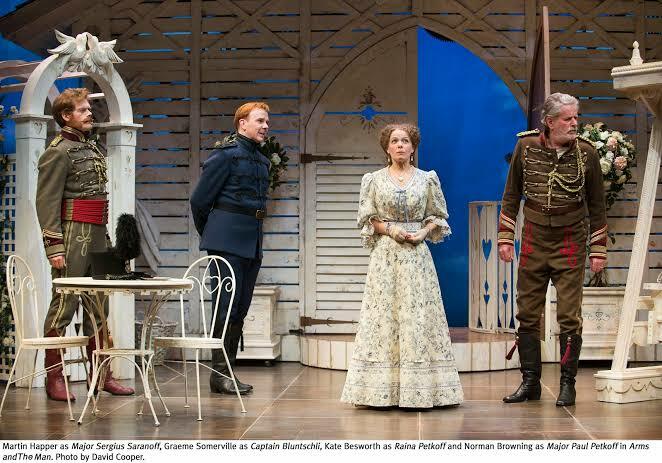 In the first Act of the play Shaw satirises the romantic notions about war. He also satirises the contemporary vanity and snobbery. How Raina’s bedroom is furnished shows that the rich people imitated the style and manner of the cultured people of Vienna. Raina shows her ignorance and foolish vanity by boasting that, “Ours is the only private house that has two rows of windows. There is a flight of stairs inside to get up and down by.” She also feels that the Petkoff is the richest and best known family in their country. She also takes pride in having their library which, she says, is the only one in Bulgaria. Catherine is like Raina, too. She puts on a tea-gown on all occasions to imitate Viennese lady. Thus the first Act of Arms and the Man is very significant for the development of the action of the play. In the whole Act we are mainly concerned with Shaw’s anti-romantic view of war. The theme of love is also introduced here. Here we find melodramatic military atmosphere, comic situations and wit and humour. The transfer of Raina’s love from Sergius to Bluntschli is also hinted at. So the curiosity of the reader or spectator is aroused regarding the course of events. There is no dull moment anywhere. It presents the contrast between romance and realism.